Parasite is fairly good mixture of science fiction and horror, but falters in believability and trying to make everything in genre fiction into a ‘series’. Some readers of science fiction want the science to be hard: a prominent component, full of details that are all consistent and completely believable/accurate. It seems that most work that fails into this category lies in the scientific realm of physics or astronomy. It is rare to find something about biology that fits these criteria. Here, Grant tries to accomplish this, taking a clever plot that bears elements of “Invasion of the Body Sntachers” and zombie films, and infusing it with scientific speculation on how this could occur. It is a fabulous idea, one I was eager to read, and involves the fictional genetic engineering of a parasite that combines properties of tapeworms with the protist pathogen Toxoplasma gondii. Toxoplasma, for those unfamiliar, can be passed to humans through cats, and is the reason why pregnant women should generally avoid cats. Interesting current research has demonstrated that Toxoplasma can be present in a host without causing any extreme illness, per se. But, it does seem to alter human behavior in subtle ways, such as causing the person harboring Toxoplasma to be more risk-prone. Fascinating science that lends itself well to fiction. Unfortunately this book just generally underwhelmed me. The discussions of the parasite having a mixture of human, tapeworm, and Toxoplasma DNA was very confusing and vague. Lots of DNA is shared between many organisms, so what DNA in particular…encoding what? Grant also discusses drugs targeting the human DNA or the parasite DNA, which was odd and not believably conveyed. Honestly, I can accept some errors in discussing molecular biology. I can suspend disbelief and enjoy the story. I personally don’t care that much if my fiction is based on hard accurate science if it makes up for errors/vagueness with other strengths. Grant writes good dialogue, has interesting characters and pacing, etc. I can’t point to anything as being poorly done, as much as say there was nothing to lift it above acceptable. There was no magic to the writing, and no particular strong life or memorable traits brought to any of the characters. In the end I would have rated the book higher as a decent, light, genre read. Were it not for the ending. To be continued. 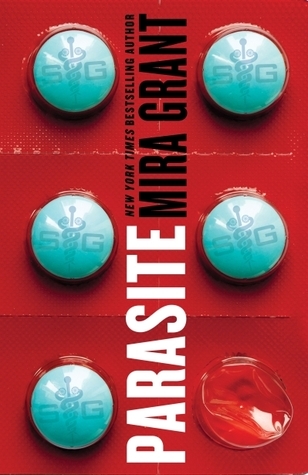 I knew this was the first in ‘The Parasitology Series’ and that Grant seems to write a few series. Series are overdone in genre, but I’m not averse to them per se. Here though, there is no need. The story could have been brought to a better conclusion with further adventures written later. A novel is not an episode of a television series in need of a cliff-hanger. While many questions facing the protagonist are answered, the overall plot and fate of many characters remains unresolved at the end of this, making me hesitant to read anything further from Grant unless a series packaged together as an omnibus.